The last weeks have been unusually warm and summer is now in full swing. Everything is blooming and growing. The spruce shoots are at their best now and that means spruce shoot syrup making for me. The syrup has an awesome flavor and on top of that, it’s also a great remedy against a sore throat in the winter. 🙂 I made spruce shoot syrup with two different flavors – one with spruce shoots only and the second with added vanilla extract. 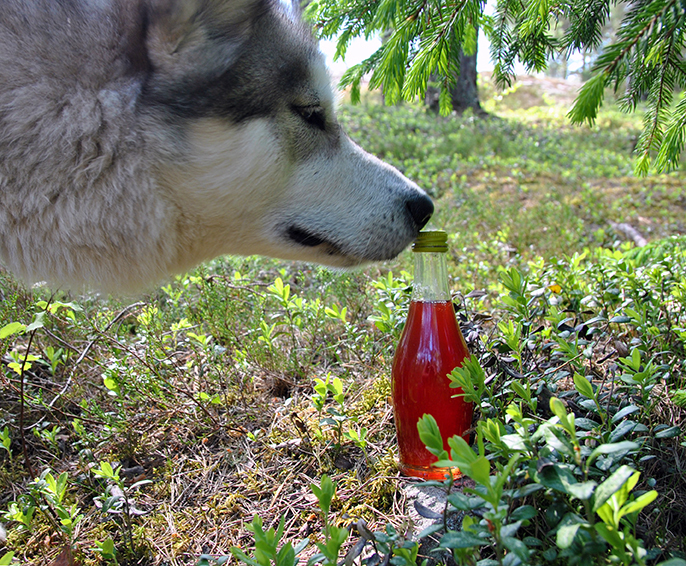 I’ll use the vanilla-flavored syrup for making spruce shoot ice cream – so friends, welcome to our place to try it out! I’m also making spruce shoot liqueur for the first time, the shoots are enjoying the hot summer day drowned in booze on our balcony. 😉 We’ll later see how that turns out. The shoots have to be picked when they’re fresh and light green, the older they get the more the taste changes. 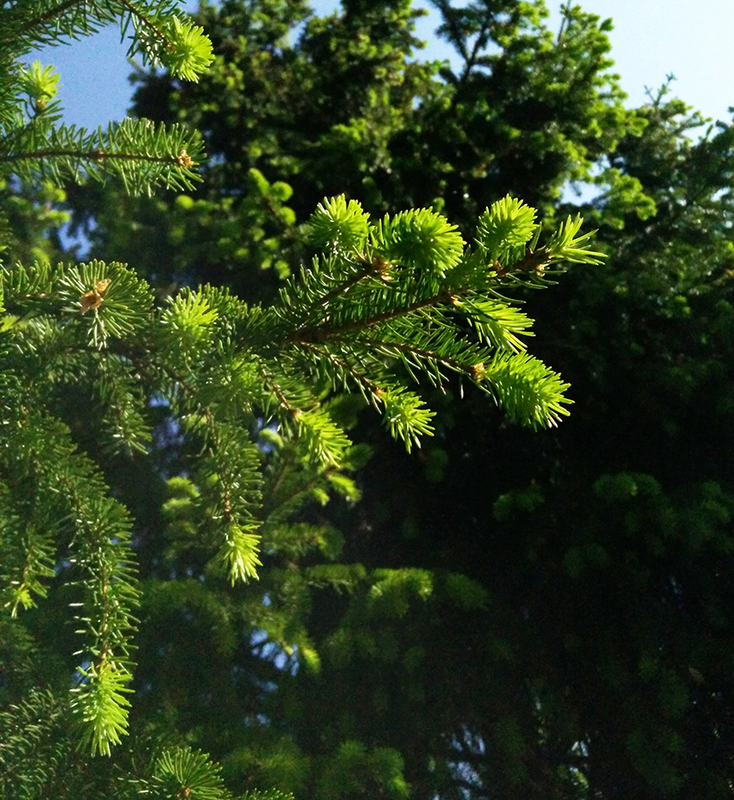 I got my spruce shoots from trees in our garden – In Finland the permit of a landowner is needed when picking these since they’re not a part of the all man rights. You can control the growth of the spruce by taking off the shoots. That’s why I choose carefully which shoots I collect and make sure that our future Christmas trees become bushy. Never take anything from the top of the spruce if you wanna keep the tree happy. Wash the spruce shoots and put them in a large pot. Pour water on top until there’s 2 liters of water and spruce shoots in total. Let the shoots boil for 3 hours on low heat, remove from the stove and let the mixture rest overnight. In the morning, separate the shoots from the juice and heat up the liquid. 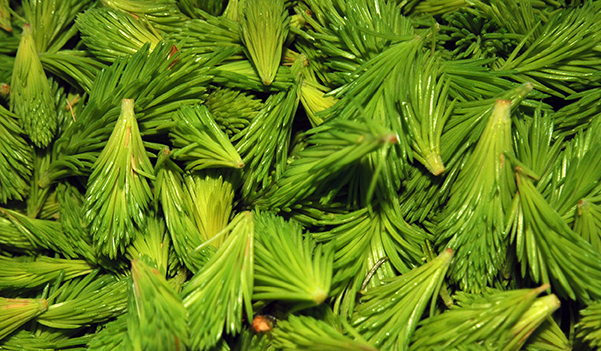 Add sugar to the light yellowish spruce shoot juice and watch it turn red once it starts to boil. If you want to use vanilla, add the extract now. Boil the syrup until it starts bubbling nicely. Make little tests every now and then by cooling half a spoonful of syrup and checking if it starts thickening. Remove all the foam that might have appeared on the top of the syrup. Once the syrup has a good consistency let it cool down a little and bottle in small, clean bottles. Keep out of the reach of gluttonous dogs. Interested in outdoor life or inspiring recipes? Enter your email address to subscribe to Wind from the North and receive notifications of new posts by email!